As time passes, we have seen technology taking place in our daily lives. We have witnessed huge dynamic changes which technology has brought over time. Since the invention of wheels to the introduction of computers, we have seen it all. But with the invention of mobile devices, technology showed how the future would be like. With time, technology has only gotten better. With mobile phones being introduced, mobile app development became highly relevant. Wearable apps seem to take up a place in the market which was completely non-existent before. Not only have they opened an entirely new way of opportunities in the technology world but they are considered more approachable than hand-held technologies. It’s only because of the amazing scanning and sensory features that wearable apps offer which can’t be seen in laptops or even mobile devices. From education, to fashion, fitness, gaming, music, tourism, to finance, and transportation, the benefits and implications of wearable technology has significantly increased. The objective is to solve day to day issues and make people realise how integrating electronic devices in their daily lives has become essential. Demand for these devices is high across industries and continues to increase at a fast speed. The reasons why wearable applications have become so relevant for mobile app development companies are many, keep reading to find out. Wearable apps that are specifically designed for offering ergonomic interface will have a relevant user interface, so people who start using them don’t go anywhere else. The instructions given to users would be specifically assembled and concise for users’ access. The idea behind wearable apps is to provide a kind of interface they have never experienced before. The tech ecosystem that has to be built for upcoming wearable mobile applications will be made in a way that it'll allow changing screen sizes dynamically. As a result, this will help make wearable apps more user-friendly. In order for wearable mobile apps to respond to individual commands and load quickly, they need to be lightweight. People will be more inclined towards using wearable apps if they prove to run more smoothly. Real time usage will consume low energy and a longer battery life of apps will be ensured. This means that people will use these devices for a longer period of time without having the need to charge it. There is a high probability that wearable applications will include customizable notifications option such as having your app in different coloured signals. This will give users a freedom to customize their app. Voice memos and single word messages are also possibilities. Wearable gadgets will offer a seamless and smooth data transmission between devices. For example, technology enabled applications and Bluetooth would have fast data transmission. Wearable apps promise to include advance features which will enhance user's interaction with the app. These features include swiping, tapping and responding to voice commands. The more engaging the app, the more time customers are going to spend on it. Wearable apps will also use artificial intelligence algorithms and augmented reality technology to enhance users experience. Augmented reality can further be used to expand navigations on maps, health-related data, and improvise voice commands. They also promise to provide real-time communication. These real-time communications can result in enhancing enterprise skills and further guide them on how to interact with their employees. As far as data storage is concerned, cloud in wearable devices will become the primary centre for data storing. However, it will also act both as a storing service as well as a place for allocating data. There are many applications that deal with confidential data. These apps have high security protocols that require a high level of security. Acces to the cloud can be done through voice recognition and biometric techniques. In conclusion, the evolution of wearable devices is going to lead the world of app development. As a mobile application development company, we can honestly say that the focus on making wearable objects will definitely take place. Every mobile application that is going to be developed for wearable devices will have a purpose of its own. From computers to mobile, to wearable devices, humans are to witness the most powerful dynamics of technology. A technology that no one has ever witnessed before and a that is going to mesmerize users with its experience. Appedology is a digital service provider with a team of expert developers. 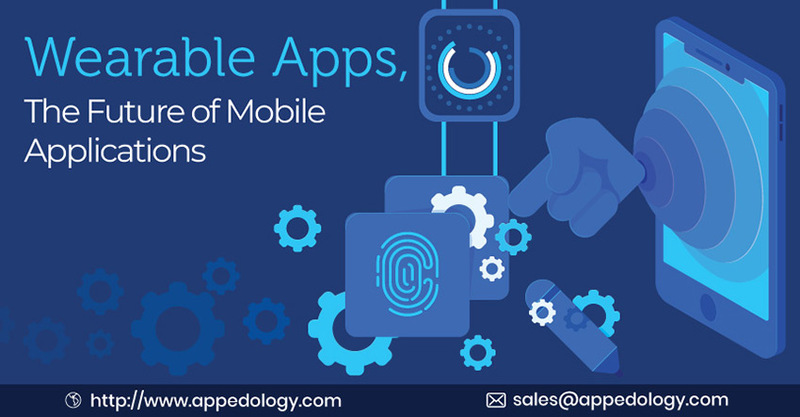 Appedology delivers services such as Android, iOS and Windows mobile development, as well as game and web development to their clients. They're also experts in digital marketing.